Black Forest Games have a new project in the works. The German developer successfully Kickstarted Giana Sisters: Twisted Dreams last year. They're trying to replicate that achievement with another crowdfunded venture. If a cooperative steampunk-esque platform shooter set in a somewhat technologically advanced (yet still medieval) world sounds like something you'd enjoy, get ready to donate some cash. Yup. That's a knight wearing power armor and wielding a mini-gun. This is just an early image, but I like what they're going for. 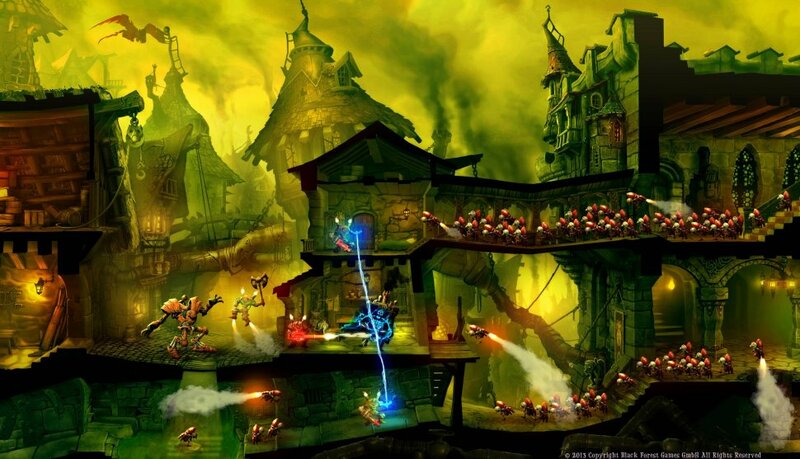 This concept art makes Ravensdale look like the lunatic offspring resulting from a drunken tryst between Castle Crashers and the Space Marines from WH40K. I can dig it. Project Ravensdale is slated to be a high-octane co-op carnage action-game, full of furious orcs armed with motor guns, rocket-propelled goblins and oodles of over-the-top craziness! In this side-scrolling platform shooter, up to four daredevils in petrol-powered armor will slam, blast and smash their way through a medieval oil rig city in the grip of chaos. Gameplay-wise, Ravensdale is gunning for a true co-op experience, with weapon choices, environment, enemies and positioning all blending together to dynamically create exciting situations that reward cooperative play. I do like shooting things, and I do enjoy co-op. Hopefully we'll see some more of Ravensdale soon. Ravensdale is very much a work in progress, but for now we know four player co-op will be supported. Platforms have not been announced, but if it's similar to the Giana Project you can expect the game to be available through the Xbox Live Arcade, PlayStation Store, Steam, and the Nintendo Wii U eShop. I wouldn't be surprised to see Kickstarter pop-up in the near future. Page created in 1.3252 seconds.